Oddities keep life interesting. Or something. I’d like to have a regular training schedule update to be able to proudly proclaim is doing me wonders in my preparation for the Bupa Great South Run but I’d be lying. A bit. I haven’t been truly convinced I’ll be running, I guess, but I’ve been preparing anyway in a roundabout fashion. My mid-week runs have continued, one hilly and one undulating but a little quicker. My weekend runs have extended to 10 miles and a few have now been logged (including the laps of the local field from another post). But it hasn’t been straightforward. A couple of weeks ago, following the Nuts Challenge, I opted to plod around the roads since rain in the days before turned the local trails to a slippery slimebath. It was a dull outing, but did the job – roads seem to lost some allure after the summer of cross country. And my legs felt the impact, as well. After a recovery run on Tuesday (albeit on the hills; can’t be allowed to recover fully, after all! ), Thursday was knocked on the head due to sore calves despite copious stretching and massage. Then, on Saturday, a more interesting 10 mile loop had me suddenly sat at the side of the road with 3 miles to go and no option of a short-cut with my right calf going into spasm, halfway between what felt like a tear and cramp. With no option but to get home, I massaged some life in to it, started off with a very short gentle stride and managed a mile before a brief massage saw me continue the change in style to the front door. Not a catastrophe, but a concern. Which demanded rest, which was booked for Sunday watching Cathy complete the London Duathlon. Which turned into such a disappointment, it’s frustrating. The decent weather of the morning ran away for the Super Sprint category (5k run, 11k cycle, 5k run) so it was to be wind and rain for the three laps of Richmond Park. Even the deer gave little rise to the spirits. And, without music to run to (it’s in the rules), Cathy was disheartened enough that she was going to pull out after the cycle bit. It was a lonely race, with groups of 20 or so started in waves to avoid carnage at transition from cycle to run; the problem was that everyone was alone on a course with no spectators and little in the way of inspiration. Except the marshals, who were absolutely fantastic. I know this for a fact. Because I couldn’t let Cathy pull out, so ran the last 5k with her. Complete with damaged leg. In jeans. And jacket. With wallet and phone and keys bouncing around. And I could see how she’d become dispirited. But the finish was excellent and my leg seemed ok, so I was happy enough. Until yesterday when my calves were, again, as stiff as anything. Not sure what’s going on, but today I decided to run to music. I haven’t really been upping my pace and fear I’ll be slower than last year around Portsmouth and the calf issue is a concern. So I selected Audiofuel’s Thru The Gears (a 15 minute fun interval session, I guess – never particularly fast but it keeps your feet to the beat and focuses the mind when the legs are a worry!) and loved it. Only 4 miles total (I did it twice as an out and back route) but the pace was good, I wasn’t fatigued at all and am fresh for an outing tomorrow. I’m going to sort my legs and report back shortly. And I will beat 1.09.53 for the 10 miles. 1.09.52 will do, despite earlier hopes for something altogether more impressive! Not one of my usual titles indicating injury, bad luck or the end of the universe for a change, just a tease about the subject of the post. There. Done it. It’s out of the bag. Last Saturday (it’s taken a while to blog – Saturday was just gone, Sunday was a day of sore muscles, bruises and happily tired limbs trying to cram a weekend into a day and the week at work has been horrendously busy – I’d almost say more than usual) saw JogBlog and me heading over to Dorking to join around 2,000 people tackling one of the assault course type events that are becoming so popular. And if this one is anything to go by, I know why they are. Previous experience of such outings haven’t been too fantastic – always a good cross country run ruined by an attempt to appeal to a group of people I clearly don’t belong to. 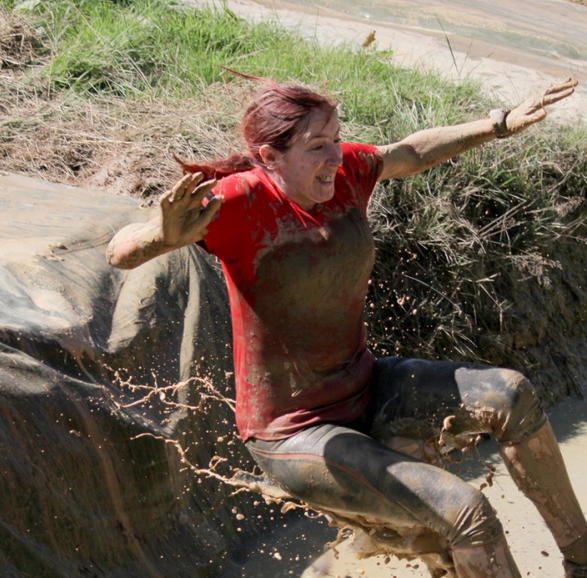 The website for this one promised a 7km lap with over 100 obstacles – a good mix of running and stuff, I hoped. The video from March looked good, if cold. That’s where I fall out with a lot of the challenges – winters outside at work take the gloss off anything that promises hypothermia! But it was August. And gorgeously sunny. And hot. What could go wrong? Looks smashing, doesn’t it? Can you guess it’s promoted by Betway?! Well they’re onto a winner if they keep promoting events like this. I might even check out their facebook page. Can you see her smile? Well? Can you? Complete with Girly Scream (she’ll kill me for passing that on! ), it just about sums it all up. A series of waved starts (with 40 minute intervals) ensured the course never got seriously busy despite quickly running into backmarkers from the previous wave. A short jog split our wave up and the scene was set by a series of gates to vault, ditches to jump (over or into, depending on energy levels and grip! ), then the first water obstacle. Which set the scene for the future, what with stopping to pull fellow “competitors” up after you’ve had a hand yourself. It’s not a race. Which is great. 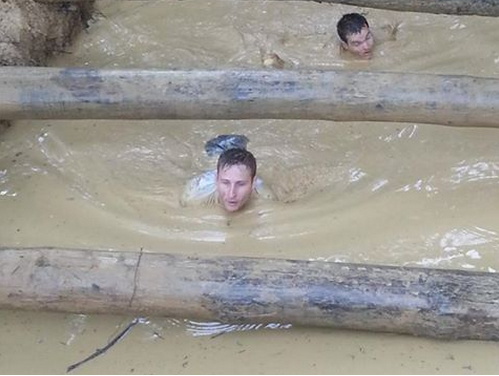 The challenges included deep ditches of chest height water, climbing up nets to get out. Climbing scaffold structures with nets and poles to slide down. Squeezing through barrels – some flat, some inclined, some ending in a 3ft ditch of clay filled water. Wading through thigh, chest and neck deep water (for a strapping 5’6″ fella such as me, at any rate!) while not being able to push on for fear of losing footing and full submersion – not a bad prospect in the temperature, except for wearing glasses! Then there were the nets to trawl through. The barb-wire stuff to crawl under. The clay to wade through. The water inflatables to clamber across. The bale wall to climb. The tyres set up as a car-wash to dive through. The tyres to carry up and down the hills. The water slide. Simply fantastic, all of it. Yes, I’ll be doing it again. Preferably as a team – I loved the outing and was as exhausted as after a full-on 10k race, with upper body aches for two days after, but the laughter of the idiots in groups was infectious and the prospect of joking around the course is almost irresistible. So – who wants to sign up? Filthy water, clay, mud, cold showers after and a great band to finish the day before visiting mum’s headstone on the way home.